This has been the worst winter for birds in my yard since we moved here in 1981. On a great many days, I saw absolutely no birds at all, even when I was paying close attention pretty much all day. We weren’t expecting any northern finches this year anyway—there were excellent cone crops further north, so redpolls, crossbills, siskins, and Pine Grosbeaks didn’t need to wander our way. But I had never imagined a winter without chickadees. One small flock moved about my immediate neighborhood, but they showed up in my yard only sporadically and very infrequently. I started wondering whether we might have lost many of the local birds to West Nile Virus last summer or fall. Our crow and jay numbers were also down this year, and West Nile hits all three species hard. I never found any dead birds in my yard over the fall or winter (though I was gone much of the time, finishing up my Conservation Big Year). Russ was keeping the feeders filled while I was gone, and we were using pretty much the same kinds of seed, peanut butter, and suet as ever. 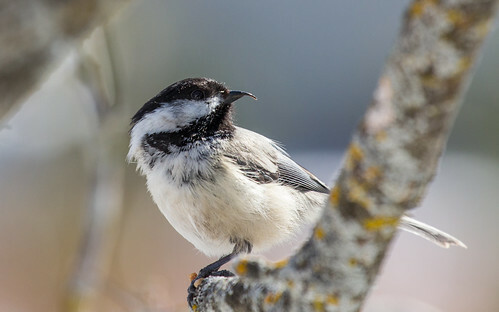 Since April 7, I’ve been hearing a chickadee singing occasionally, and on April 16, one was flitting outside my window expecting mealworms, so the next day I went out and bought some. Sure enough, it came back on Friday, April 18, and I noticed that it has a deformed bill. The upper mandible is way too long, and bends weirdly to the bird’s left. The lower mandible appears normal to my eyes and in my photos, but a closer look would be necessary to be certain. This is obviously one of the birds I fed regularly two years ago for it to remember that I open the window with mealworms in my hand. So this is especially heartbreaking for me to see. 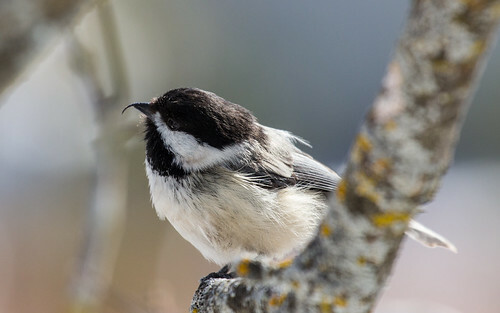 Birders in Alaska started reporting chickadees with deformed bills—some with both mandibles horrifyingly elongated and crossed—in 1999, and since then, have found over 2,000 chickadees with the condition in south central Alaska, along with rapidly increasing numbers of deformed bills in birds of other species, including Northwestern Crows, Downy Woodpeckers, Steller’s Jays, and Black-billed Magpies. The US Geological Survey has been investigating possible causes, including environmental contaminants, nutritional deficiencies, and disease, but so far have no solid evidence about what is going on at all. According to the most recent information I can find, they believe the problem is fairly specific to the Pacific Northwest. But in February, Jim Williams, who writes about birds for the Minneapolis Star Tribune, received a report of one visiting a Maple Grove feeder from late December through at least February. As far as I know, mine is the second report in Minnesota. I’m hoping if anyone else sees one in our area, they’ll let me know. 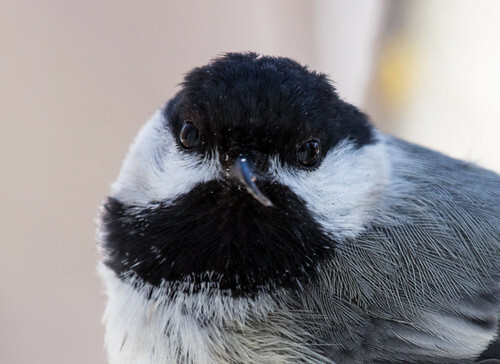 Even more important, though, is to report any sightings of deformed chickadees to the US Geological Survey’s researchers studying the problem. Their Report Form is here. I feel a special obligation to my backyard chickadees—they’ve provided me with so much joy and pleasure throughout most of my life, and my afflicted bird is one of the individuals who has come to know and trust me. So I’m trying to get this bird banded and am hoping I can get the bill trimmed, too. Observations of the survivability of deformed birds without intervention provide valuable scientific data, but I think it’s also valuable to learn how rapid regrowth is. Unfortunately, I had to leave town on April 22, and won’t be back till May 1, but Russ is going to try to feed him every day. That in and of itself will be an interesting experiment to see how quickly it adapts to taking food from a new person—I’ve been the only one who feeds chickadees by hand in my neighborhood for lo these many years. I’m hoping very much that the two Minnesota cases are isolated aberrations, It’s scary to think something is happening in the environment that is taking a toll on such a splendid and beloved bird, but if this is the start of a serious problem, the more information we can gather, the faster we can figure out what’s happening and do something about it. Hello, I haven't checked your blog in awhile so nice to see new posts. I haven't noticed this problem in our area but I will keep an eye out. I live in Richmond BC not far from the George C. Reifel Migratory Bird Sanctuary (http://www.reifelbirdsanctuary.com/). Chickadees are my favorite wild bird I've spent many pleasant afternoons feeding them by hand. Field Trip to See Displaying Spruce Grouse!